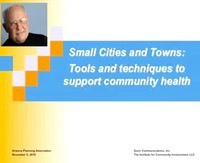 Arizona Planning Association Conference: 2010 | LL DECKER & ASSOCIATES, INC.
One of the most attractive features of small cities and towns is their natural ability to build and maintain a healthy social fabric. While this close-knit affiliation can be very beneficial, this same quality can create jealousy, divisiveness, incivility and toxicity. How can planners use the natural drive of human beings for affiliation (kummunity) to create healthy cities and towns? What can policy makers do to build “community” into their communities? What tools and techniques can help maintain a positive, progressive and healthy social structure? What can leaders do to redirect a community that has turned toxic?